Therapists do not typically keep boxes of live spiders in their desks. That can make it tricky to treat patients suffering from arachnophobia using exposure therapy, one of the most popular ways to combat phobias. So startups and universities are starting to treat phobias using virtual reality. With realistic and immersive technologies like the Oculus Rift, therapists could help a patient overcome crippling fear using safe, easy-to-wrangle simulated spiders. Nearly 9% of the U.S. population suffers from a specific phobia according to the National Institute of Mental Health, which classifies it as an anxiety disorder. In exposure therapy, a patient gradually faces their fear in a controlled situation. A program at Newcastle University's Institute of Neuroscience is testing virtual reality to treat children with autism spectrum disorders who suffer from phobias. So far, they've created simulations for a fear of pigeons, speaking in class, riding a crowded bus and shopping. 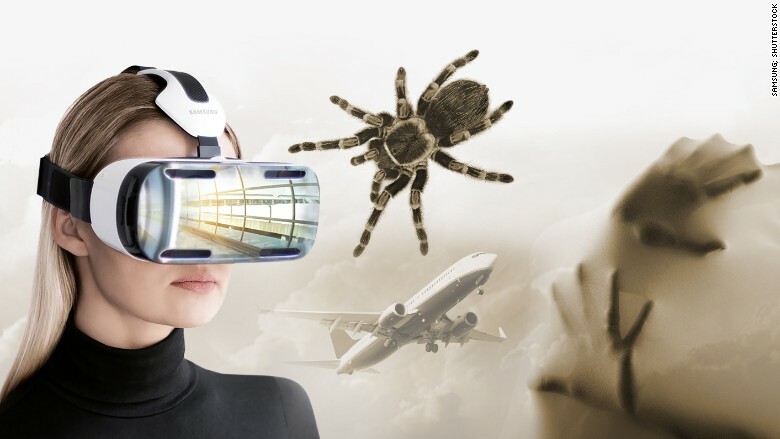 Spanish startup Psious has designed phobia treatment scenarios for a fear of flying, needles, crowds, heights, spiders and cockroaches. The software works on augmented and virtual reality goggles like the Samsung Gear. It's cloud-based so therapists can control the entire simulation and conduct sessions remotely. When patients put on VR goggles, they're transported to the 52nd floor of a skyscraper for a fear of heights, or shoved inside a crowded elevator if they're claustrophobic. The field is still young, but early results are positive. In Newcastle's first study, four of the nine children completely overcame their phobias and two learned to manage their anxiety enough to functional normally. The team has teamed up with the UK's National Health Service for a second, larger, study. Currently, you can't try this at home. "A therapist is always needed to help people learn to manage their anxiety and also to help with follow-ups when the person tries out their new skills in real life," said Dr. Morag Maskey, who heads the Newcastle program. Virtual worlds won't trick a person into thinking they're actually on a plane, in a crowded square, being pricked by a needle or facing a horde of birds. But for many people who are afraid of flying, just the sound of a plane's wheels going up is enough to set their heart racing. "It allows you to have the same or very, very similar experience you're having in the real world, but you have some control," said Xavier Palomer, co-founder of Psious. More control is one of the main advantages to these types of therapies. Real life can be unpredictable, and VR allows patients to experience milder levels of anxiety and know they are safe, according to Maskey. For fears like flying, it's also cheaper than a round-trip ticket. At the end of the day, even with the best animators and video, patients know real tarantulas aren't crawling across the floor. It's possible some people won't find virtual reality real enough to trigger anxiety, but Maskey says they haven't encountered anyone who didn't react yet.